as promised, here are some screenshots of the new weather radar graphics which will be available as a bonus for users who purchase the new Aerowinx Nav Database Update for 2016 or later. There are no changes in the aerodynamics model: When you fly into the "red areas", you will experience turbulence; and even more turbulence if the vertical size of the weather core is greater than 15000 ft. Also please note that the model keeps refering to the weather in PSX, not to the weather in scenery add-ons (unless the add-on injects it into PSX, but the exact location of storm cells are still generated by PSX at random). The new radar graphic system paints clouds, turbulence, and terrain in a different, more realistic way. For those new to this topic: The terrain image generated by the radar system is not the same as the terrain image from the EGPWS. The EGPWS contains an on-board, world-wide terrain database, and uses this to create a map image (with colored tiles) for the current aircraft position every 4 seconds. The EGPWS sends this map image to the ND through the same raster data bus that the weather radar uses; that is, it sweeps left and right across the ND and therefore looks very similar to a radar sweep; but this EGPWS image is not a radar image, and the radar image is never an EGPWS image. When the EGPWS image is shown, the ND indicates the word "TERR" in the lower left corner. 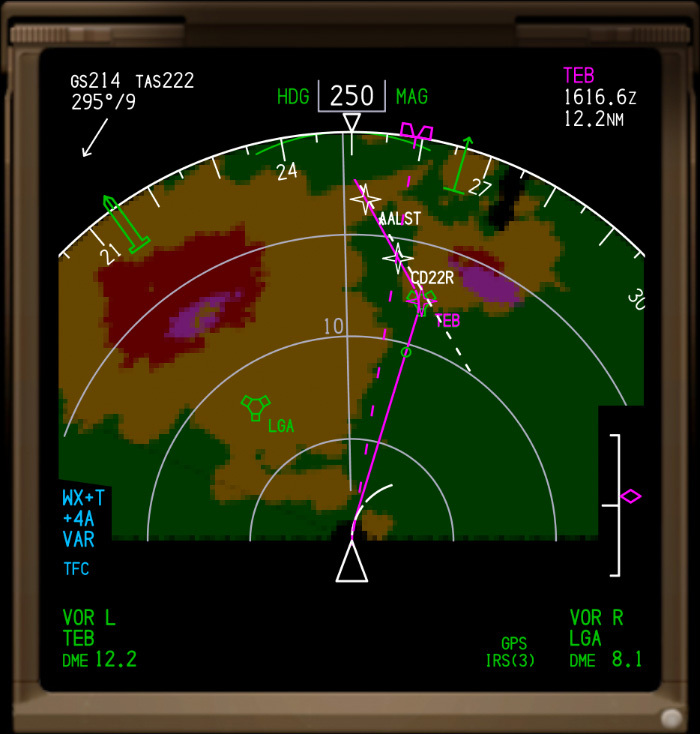 Whereas when the radar image is shown, the ND indicates "WXR" or "WX+T". The "T" does not stand for "terrain"; it stands for "turbulence". The weather radar can also operate in map mode which intensifies radar returns from the ground while reducing returns from the clouds. In that mode the ND indicates the word "MAP" -- but it displays plain radar returns, no EGPWS! 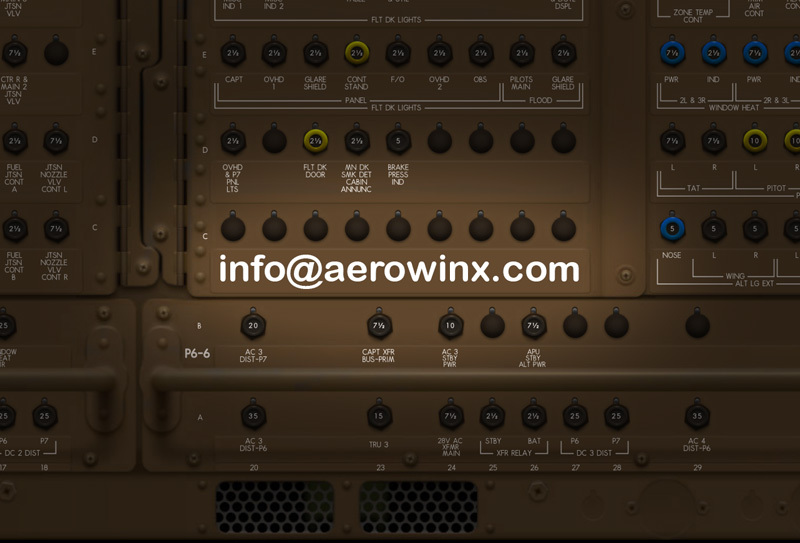 For more details, please refer to the Aerowinx manual, pages 306, 487 and 488. Regarding the weather radar, it's also important to distinguish the auto mode from the manual mode. The pictures below are taken during manual control. In auto mode, the antenna gain and tilt are controlled automatically, and digital filters and image buffers compute optimized images for the pilots. The antenna tilt angle is manually set to +2°, and the aircraft is at 15000 ft. That lonely red spot on heading 045°, 18 nm, on the left ND, is Mount Fuji near Tokyo. 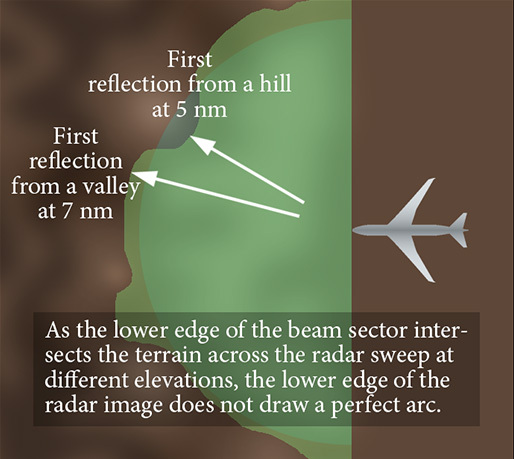 The radar beam angle is vertically so high that only the tip of Fuji is scanned. In the old version such effects are not modelled. In the old version you can see a large black "disk", whose center is at the radar antenna, and whose radius extends to 60 nm in this example. Beyond this black area you can see ground clutter (radar reflections from terrain) in various colors. The colored area is the one that the radar is scanning, i.e. the black area lies outside the -- vertical -- radar beam sector. This black area gets smaller when the antenna angle pitches down, or when the aircraft altitude decreases. Now, in the old version the black disk has a constant radius, and includes some random generated notches at the black edge which are supposed to make it look more fuzzy and hence more realistic. But that's not optimal. In mountaineous regions, the black "disk" cannot have a constant radius, it would make no sense geometrically. The new version looks much more realistic; it uses the actual elevation at each reflection point not only to model the terrain roughness (which affects the radar return intensity and the associated color logic), it also uses the elevation points to model the radio range of each point. 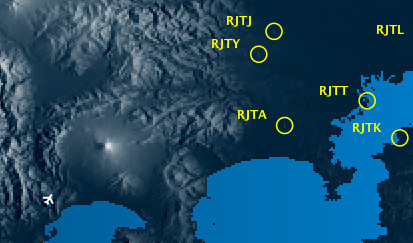 The radio range is a function of elevation and aircraft altitude. The result: The black radius is shorter in those scan sectors where the radar beam is first reflected by higher terrain, and is longer where the beam has to travel farther into valleys until it gets reflected from lower terrain. The black disk is now a black potato, so to speak. The model is still slightly simplified, but a lot more plausible. The following two drawings illustrate this principle. The model also includes the curvature of the earth. One degree on the tilt angle is a lot since the line of sight quickly tends to infinity when the tilt angle is close to 0°; at 60 nm ahead already the tilt is increased by a whole degree in relation to the surface. That is 4° for radar targets 240 nm away. The maximum radar range is 320 nm. The ND range is now zoomed in to 40 nm. It shows the same region near Tokyo, but with the antenna tilt lowered to -1°. Almost the entire basis of Mount Fuji (on heading 045°, 18 nm) is now visible in the new version. In the old version the black radius is correctly reduced in relation to the tilt change, but the radius is constant as usual, which would be realistic only when the terrain was totally flat. The tilt is further lowered to -10°; another black zone now appears beyond the upper edge of the radar scan area. The elevation effect at the outer black border is similar to that of the inner black border, just reversed: Higher terrain along the earth's curvature is visible over a longer distance than lower terrain, which sinks below the radar horizon earlier, hence the colored ground clutter radius is shorter in those low-terrain sectors. Additionally, in the new version, with this radar setting, Mount Fuji causes a radar shadow on the backside of the mountain. Mountain shadows can also appear on real radar systems. The old version doesn't model mountain shadows (just cloud shadows). In the inner black area there is a large black bay at 2 o'clock, 15 nm, in both versions; this is part of the coastline south of Mount Fuji. The following five screenshots show radar returns from clouds, and the effects when changing the radar gain. In the new version, gain changes are more noticeable in the core of a weather zone. Like on real radar systems, irrelevant clouds around the core, like cirrus or small cumulus, are no longer displayed. Also the core itself is only shown if the radar returns are strong enough; this means, in the simulator, if the core's vertical size is greater than 2000 ft and the cloud cover is at least 3/8, or if there is precipitation or a storm cell. In the old version, there was always a large, round, spiral-like cloud formation around the core (depending on the weather zone radius), which wasn't chaotic enough too look perfectly realistic; some simplification was required because all this random chaos needs to be synchronized with all networked PSX instances -- without sending videos or pictures through the network, which would increase the data traffic enormously. In the new version, there are still no pictures going through the network, even though the graphic complexity and randomness has been increased a lot (PSX keeps using a certain deterministic random seed technique for the radar network). With the gain set to the minimum, the new version shows no amber or red returns; the gain control is smoother. With the gain at -6, amber returns appear in the new version. The old version shows red cores already, along with the spiral-like cloud formation around the core, which will no longer occur in the new version. The new version shows some fuzzy objects instead, like on real radar systems. This fuzzy noise is distributed within an arc-like random shape and is drifting during the simulation progress. The gain is now raised to -4; very small red returns appear in the new version, and some ground clutter appears beyond 80 nm. Some radar shadows occur; in this example they are no mountain shadows but shadows from the storm cells. The old version includes such shadows also, but in this example most of the shadows are overpainted by other weather zone objects. In the old version, each of the 7 weather zones is painted completely until the next zone is painted; that is, a zone paints its green, amber, and red color layer, and then the next zone paints its green, amber, red layer, and so on. This way a green neighbour area can fill the black shadow of a previously painted zone. The new version doesn't have this problem anymore: it paints the green layer for all 7 zones, then the amber layer for all 7 zones, and so on. Cloud shadows can now even hide ground clutter. Now playing with the tilt knob -- the gain remains fixed. The tilt is set to +6°. The lower edge of the radar beam intersects a fraction of the top of a storm cell on heading 050°, 90 nm. That cell has a very low top. Another cell at 30 nm extends to higher altitudes and is fully scanned at this tilt setting. Tilt lowered to +5°. The radar now sees the full width of that cell at 90 nm. Left of that cell is a radar shadow caused by the larger cell at 30 nm. Tilt lowered to +4°. Another target occurs on heading 355°, 90 nm. The top of this target must be even lower, as it disappears when the tilt is above +4°. The tilt is further lowered to about +3.5°, but the ND still indicates +4 because the number is rounded. A fourth target occurs on heading 040°, 80 nm, with a very low top. It's located in the middle of that shadow mentioned above. Although the above examples show radar shadows, there is no amber PAC alert on the compass arc. The alert requires certain conditions; one of them is the gain being set to 6 (knob in 12 o'clock position). Here on screenshot 13 the gain is in normal position and the entire radar system is in auto mode. Behind the target at 80 nm there is a black sector, and the radar system figures out that this might be a radar shadow, thus it shows the amber PAC alert arc on the compass rose in that sector. The alert is helpful because there might be another, invisible storm cell within this shadow. Here's another comparison between the new and the old version. The new version shows a lot more realistic, chaotic structures, where the old version constructs its typical spiral-like formation with rather simple cloud fragments. In the old version, the cloud fragments appear particularly edged when the ND range is set below 40 nm. In the new version, the display keeps its realistic, fuzzy, chaotic look. Also apparent in the new version at this low ND range is the absence of object overlaps; unlike in the old version, there is no longer any green object overlapping an amber or red object, nor any amber object overlapping a red object. The entire image is painted color by color rather than zone by zone. New version; same example, with ND range set to 40 nm. Two radar shadows in view. 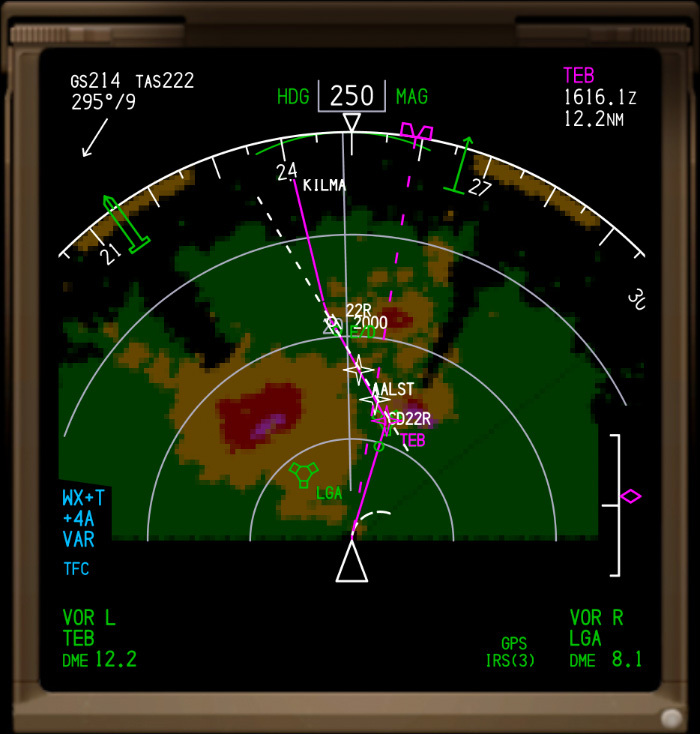 By the way, in the new version, the magenta turbulence areas are shown only for moderate and severe turbulence. If a cell is smaller than 15000 ft, the turbulence is light (this was a general modification in one of the last PSX updates), and therefore not marked in magenta anymore. Very cool. . This is a reason for me to buy the new Nav Database Update. Will try how the Innsbruck approach looks with the new radar. Thank you very much for your efforts and good night. The only comment would be from an entirely personal perspective, and of course depending on equipment used, I have never seen such clearly-defined radar shadows.. This must be the best PC wx radar ever...! I could add a bit more randomness? Maybe...don't change it just on my account though. What do other 747 pilots/radar users think? That is looking phenomenal Hardy! Great work! Using screenshot 12 for reference. The cell creating the shadow is fine. The next cell in the shadow needs the yellow sector to be less yellow, and where the red sector would be, to be lightly peppered green. The rest of the shadow from that point is fine. I think this would also fix the problem Britjet is talking about. How is storm strength determined? Purely vertical extent? If the cell in screenshot 12 creating the shadow is 15000 ft tall, then if the cell is 25000 ft tall, then the shadow wants to be stronger. I'd suggest the shadow in the image (as drawn now) was of a cell 35000 ft tall. Shadows and magenta turbulence appear when the vertical size of the CB is >15000 ft.
Of course, you need stuff around the shadow to see the shadow. This is not so often the case, especially in auto mode with all ground clutter eliminiated. So in regular scenarios you will see such shadows not as often as on those screenshots. They are extreme examples. Congrats to the new WXR graphics. Looks amazing! Scalloped or roughened edges, pendants, fingers, hooks, and U-shapes on weather radar thunderstorm displays all indicate the presence of sheer forces and turbulence. They may also indicate the presence of hail. Increase the avoidance distances by 50 percent for echoes that are changing shape rapidly or are exhibiting hooks, fingers, or scalloped edges. Are the features mentioned above be noticable in PSX? Yes, with ref to fig 12 - I've never seen a black line through a cell like the second one in the image. I think that still showing the full extent of the storm behind, but attenuating the effect so that it appears less vigorous than it actually is, may be the way to go on this? Maybe an attenuated "shadow"? In my extensive travels through Africa at night (!) we could see the second storm beyond the first one, and even the third if there was one - so much so that you could plan a "zig-zag" course between them and it would usually work. Whether we were seeing the full effect of the other storms due to attenuation from the nearer storm I wouldn't know, but it seems probable..
Hi Walter, at random perhaps, but not intentionally and directly by the atmosphere model. Hi Peter, you will not always get such a shadow like on the screenshot. The screenshot just shows an ideal 3D constellation to demonstrate the possibility. You won't get exactly this 3D setting all the time on your random PSX flights. That sounds fine, Hardy. It certainly looks very good! ca. sec. 27 in the video you can see a small cell behind a large cell. yes, I know. Sometimes there are shadows, sometimes there are none -- in real life and in PSX. My screenshots show examples of shadows in certain constellations. That doesn't mean your ND will always look like these screenshots. I have to say that I'm not convinced that is a thunderstorm radar shadow in the left image of the 7700 page. The whole thing looks much more like ground returns with the radar tilted down to me.. It depends on the tilt and the 3D positions of the aircraft and the targets relative to each other. By "3D" I mean to imply the vertical geometry, not just the lateral angles.